A new feature coming to THP is something we are calling “Duel Personalities”. The features will showcase around a new piece of equipment in the hands of two very different golfers as they put it to the test and banter about it through written words. Here is the first edition as Todd H & Jason K take a look at the soon to be released Nike Machspeed Black Driver. 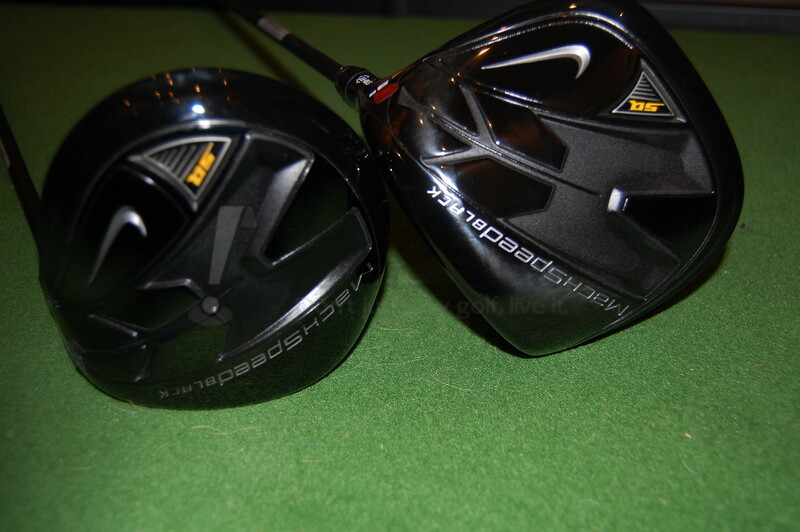 Last month at the second THP Golf Outing, myself and fellow equipment tester Jason K were able to demo and put into play for two rounds the yet to be released Nike Machspeed Black driver. And what was cool about this, beyond hitting a pre-release club was that we got to test and play BOTH the round and square version installments to the Machspeed line. The results were surprising for the both of us to say the least. Two different golfers of two different skill levels each hitting two very different drivers. But first let’s look at some of the technical aspects of the club. Nike and Nike Golf are some of the most recognizable brand names in the world today. As the market for golf equipment and apparel continues to expand and grow, so does Nike Golf. Nike Golf certainly has certainly become a leader in golfing technology and it’s latest release, the Machspeed Black driver, represents this growth in golf equipment technology. Visually the look is stealthy. Black head, matte black shaft, black grip? The driver looks like a, well, a stealth fighter. The familiar larger than normal hosel which incorporates the Str8-Fit technology is still there but blends in rather nicely. Nike has chosen a traditional ‘pear shape’ for the Machspeed Black and offers it with a 460cc head for both the round and square versions and is available in either a 9.5, 10.5 or 11.5 loft. 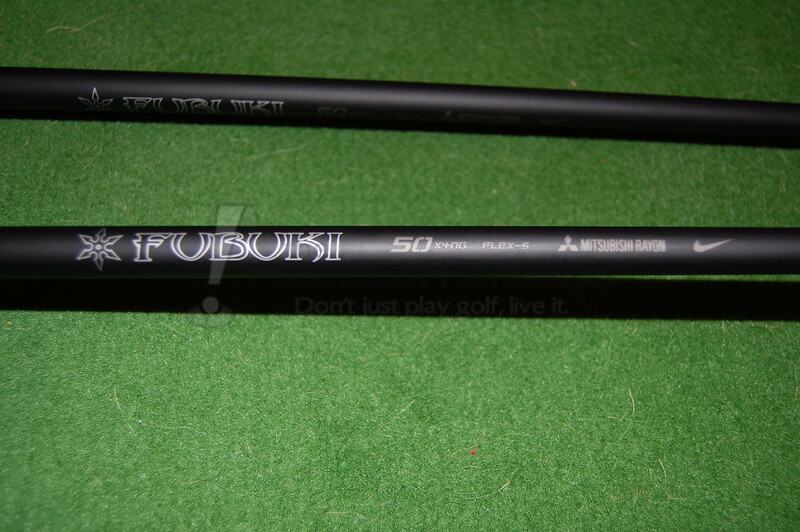 The stock Mitsubishi Rayon Fubuki shaft comes in a length of 45.75 which is available in flexes of extra-stiff, stiff, or regular. Don’t let the black face fool you on this club. It may not feel ‘hot’ but it’s hard to argue with the results you see when you see the ball launch off the face and take off into the sky. 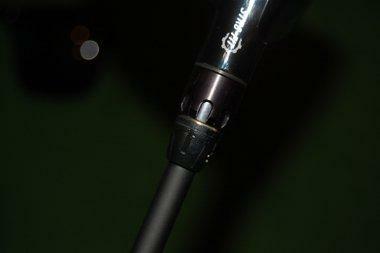 Next is the Str8-Fit Tour Adjustability feature. There are 32 different possible face angle combinations which is more than enough for most hackers. This includes 15 options for either left or right ball flight and 2 for neutral ball flight which means multiple options for shot-creation. As is with previous models that have the Str8Fit technology, changing the face and head alignment was simple and straight forward to use but once you find a setting you like, we say stick with it. The ball flight that you get from all these settings is pretty true. Not too high, not too low. The ball takes off at a medium trajectory that peaks fairly high (but not ballooned) and drops down with a little run to it. This is definitely not your typical high launch/high spin/fall out of the sky straight down driver. Ok now that you’ve read about what went into the making of these drivers, you’re probably wondering how we liked the Machspeed Blacks right? Check it out. Todd H: Yo Jason! We both got to hit the square version and the round version of Nike’s new line of Machspeed drivers. We’ve both had them in our bags for the past month with mixed results to say the least. So the whole world wants to know, boxers or briefs? Just kidding. Which version do you like better? Round or square? 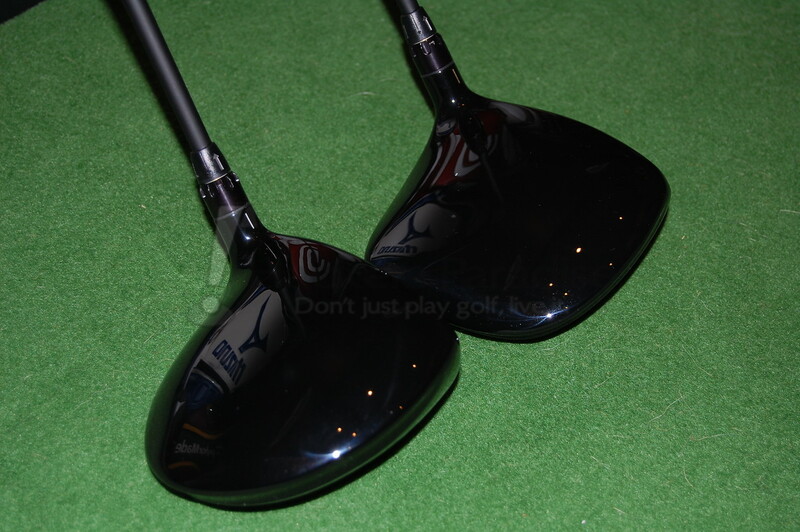 Jason K: Ah yes, the age old question of round driver vs. square driver…..that is age old isn’t it? Ok well maybe more like the new age question, square or round? Well let me say that I love the looks of both, but after seeing you constantly assault roof tops with the round Machspeed Black, I thought I would be best taking the square for an extended stay in my bag. After one round with the….er….round driver I left the THP Outing with the square one in my bag. I’m now thinking I may have been better off with the other one though. How about you? Todd H: Rooftops? I know not of what you speak kind sir! Let’s be clear, the fact that I was hitting rooftops doesn’t mean the ball flight of this driver is a high launch one. It’s actually a mid/mid-high launching club with mid/mid-high spin. That being said, those homes were single story homes so they weren’t as high as you make them out to be. Like you I was able to play a round with each version/shape and came away liking the round one better. Sorry square version but I failed geometry in the 10th grade and still have a thing against ‘shapes.’ The round version just looked better at address for me and somehow felt like the face was a little hotter than the square even though both have the same face technology. Although I did find the square to be more forgiving and actually straighter but who wants that? Especially when there are backyards that you can play from when you miss the fairway. Jason K: I was really disappointed in the square Machspeed Black. I’ve never had a chance to hit a square driver before so some of the short comings may have been my own fault, I just don’t know. The thing is just weird to look at and I couldn’t get used tot he closed appearance at address. I tinkered and tinkered with the Str8Fit settings and even tried to open the face one degree. While this helped the driver appear to be less closed it didn’t actually help me hit the ball straight. I find it strange that I struggled keeping a square headed driver going straight. Isn’t that the whole idea behind these goofy shapes? Distance wise I’ll say the round Machspeed did seem longer than the square and I’m not sure why. The head of the square one is much shallower (a good ½ inch or so) than the round one and that made a big difference to me. Distance wasn’t what I had hoped for and it was harder to hit straight which seems exactly the opposite of what I expected from a square driver. Todd H: I love your honesty. So refreshing. It’s like a fresh breeze from South Dakota or wherever you’re from. Confidence and comfort with any club, especially a driver, begins at address, If you can’t feel comfortable when first looking down at a driver then how can you feel the same comfort hitting it? Since we’re talking about these things looking like stealth fighters, I thought the square one was a ‘dead stick.’ Not a whole lot of life to it but it worked. Not as well as the round one mind you but for those looking for some forgiveness in a driver, the square one may be the way to go. Let’s move onto the hidden gem of this club, the shaft. 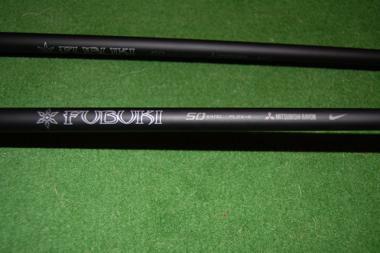 Both Machspeed Blacks come STANDARD with a Fubuki shaft available in either extra stiff, stiff or regular flex. Again we both got to play each flex of this shaft so what are your thoughts on this goodie? Jason K: I hear you on the confidence thing. Without loving the look of your driver you can just about forget it in my opinion. Before I move to my thoughts on the shaft I want to touch on one last thing about the square Machspeed Black. It’s not a bad club. In fact I think it’s pretty nice for some people. I witnessed first hand how the square Machspeed Black did show some pretty significant improvements. I had a friend with a higher handicap than mine play it for an entire round and by the time we were finished he was ready to buy it. I don’t know but it wasn’t for me. Now here I go agreeing with you one more time again. I saw this joint review as a way for me to publicly disagree with you. What gives? Anyway, hats off to Nike for sticking a straight up awesome shaft in the Machspeed Blacks. The Fubuki shaft rocks in these clubs. I think it’s great that a major OEM like Nike has seen the importance of offering a quality standard shaft. Todd H: Hey buddy, it happens to the best of people. Agreeing with me isn’t so bad. I too think that the Fubuki shaft is the real deal and really cements the lethal and stealthy look of the Machspeed Black. I preferred the stiff flex myself but found that on misses out toward the toe that the shaft would really flex and vibrate letting you know you missed the sweet spot. The shaft really kicks the ball into the air but not overly so and you really feel the shaft and head working together to get the ball moving off the black face. The all black look of the head, face, shaft, and grip is unique and you are just drawn to it. Nike is really bringing some heat with this club by throwing this level of shaft into an off the shelf club. I think you’re going to see a lot of Machspeed Blacks in other duffer’s bags this year once these officially hit street. I mean you have looks, technology, brand recognition, and a serious fan base of the company. What’s not to love? Pilot to bombardier, prepare to bring the rain! Jason K: I don’t want people to think that I don’t like the MachSpeed Black drivers because really I do, I love the looks and I definitely agree with you that I expect we’ll see a lot of these in golf bags as soon as they’re available to the public. Nike really has something for everyone in this release. Some may like round, and some may like square, but one thing that is for both is the technology and looks packed into the new Machspeed Black driver. Don’t believe our two Dueling Personalities? 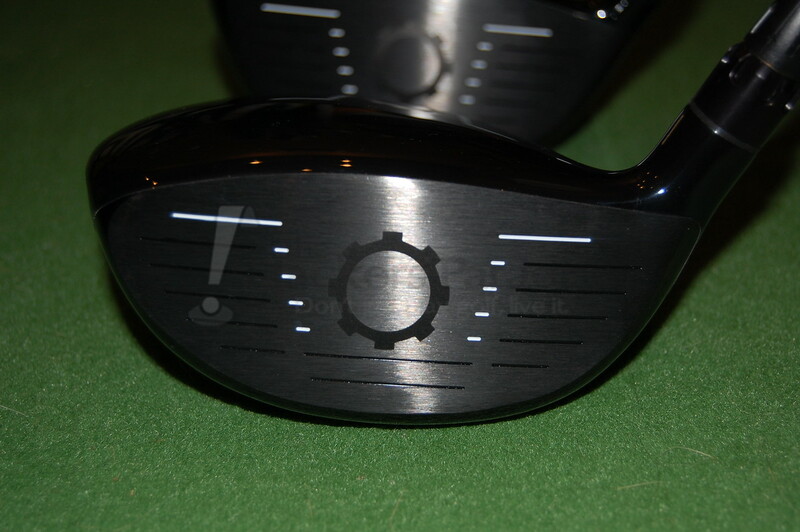 Check out what the other 50 golfers had to say about it at the recent THP Demo Day. 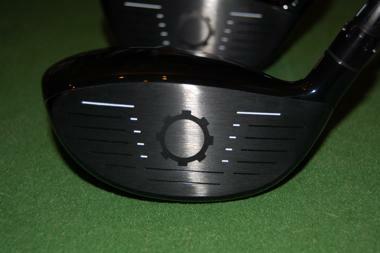 The new Nike Machspeed Black driver will be available November 26, 2010. For more information on this driver or any other golf equipment from Nike Golf, check out their website at www.nikegolf.com. Todd H. & Jason K.
I like this idea of getting two thoughts into one review. Great job guys! Interesting! Do you know if its a real deal Fubuki and not a made for type deal? Going from a square driver to round of the same line, I definitely can relate to your feelings on which is longer. I must say, that was a bit different in the way of a review, but I liked how this went. Two perspectives showing the highs and low’s of an item, how better can you get across what you really noticed. That is awesome. I’m gonna have to see if it can swap into my Dymo. If not sounds like the round version can be added to a personal driver shootout. Fantastic, honest review guys. This was a hoot to read guys! Great job!! I’m kicking myself for not taking a few swings with this at the outing, especially as I was playing the Dymo at the time. All around, a solid review! I really like that square driver!! I can’t wait for the release!! Love the dueling review. This is a sharp looking stick.